The Secret Recipe Club is a fun monthly event in which bloggers are assigned in secret to make a recipe from another blog, and then post about it at exactly the same time on reveal day. The group is now so popular that new members must wait in a long line for a chance to join. This popularity also explains one of the rules: if you mess up and don’t post on reveal day, you are out of the game, leaving an opening for someone else to take your place. It’s only fair, after all: it’s very disappointing to have your blog “orphaned” on reveal day. This month was a bit of a stretch to participate, but I’m sure glad I did. My assigned blog was Baking and Creating with Avril. Did you notice the “Baking” in the title? I have a slight suspicion that the SRC organizers like to have a little fun at my expense… How else could it be that I’ve been matched with serious bakers for months in a row? 😉 Still, I love a challenge, and as soon as I got the assignment I jumped into Avril’s cool site, in full “blog stalking mode”. After narrowing a long list of tasty options, I could not decide between the blueberry galette or the white chocolate cranberry bars. You see, she’s got some seriously delicious stuff posted. Phil, the blueberry-addict, made the choice for me. Blueberry galette it would be. Make the crust: In a bowl of a food processor add the flour, sugar and salt, process to combine. Drop the cold butter pieces and pulse until small pea size crumbles appear. In a small bowl combine egg yolk and milk. Pour into food processor and pulse just until combined. Take dough mixture out of food processor and put onto a piece of parchment paper. Form dough into a large disk, wrap parchment paper around it and place in refrigerator to chill for at least 30 minutes. Make the filling by mixing in a large bowl the blueberries, flour, brown sugar, pinch of salt, cinnamon and nutmeg. Preheat your oven to 350 degrees. On a lightly floured surface roll out the chilled pie crust to about 12 inches in diameter. Transfer to a parchment lined large baking sheet. Place the filling in the center of the pie crust, then fold up the sides pleating every now and then. Brush with warmed apricot preserves. Place in preheated oven to bake for 50-60 minutes. Rotating the pan halfway through. Let cool for 15 minutes before slicing and serving. Comments: As far as taste goes, I hit the nail in the head. I could eat the filling of the galette by the spoonful over some nice, thick yogurt. But, let’s be honest: my product wouldn’t make the finals of the 2012 Galette Beauty Pageant. In my defense, I made this recipe in one of the busiest weekends ever, preceded by a full day flying back to OK and a lab move that began the next morning (Friday) at 5am! That weekend found me like a zombie trying to finish countless tasks at the same time. Don’t let my boo-boos prevent you from making it. 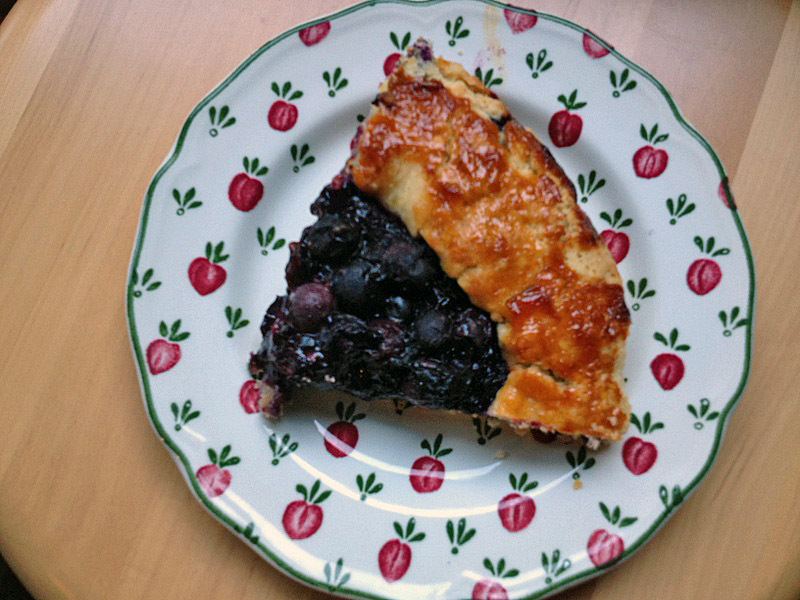 Avril is right, the galette is incredibly tasty, and you should also consider making the original recipe (link is in Avril’s blog), that includes a mixture of fresh peaches and blueberries. Oh, my…. Avril, it was nice to “meet” you through The Secret Recipe Club! I hope you had a lot of fun finding your assigned blog and cooking from it! what a fun “club”!!! i was not aware of it. Will need to go check it out. I adore galettes: they are rustic and fast to prepare, very satisfying without being pretentious. Like pies without the fuss! I have just a batch of blueberries that we picked at the beginning of the summer in my freezer that are calling for this preparation. They are also a little lighter than pie, I think – a slighter higher proportion of filling to crust. Beautiful galette. So full of fruit and with that wonderful crispy pastry too. Divine!! Rustic = Gorgeous in my book! Love the look and I’ll bet I’d love the taste, forwarding this one on to the resident baker! Resident baker: every home should have one! That’s a beautiful rustic pie! Those types are not to be perfectly crimped and presented, it’s the beauty in the rustic form. And I so prepare making pies that way even though I can crimp like the best of them! Phil made a good choice, I love blueberries too!! Such a pretty plate too for that slice of pie!! I don’t know, by the looks of this beautiful galette, I’d say you fit right in with those serious bakers Sally! I am particularly taken by the crust… it looks golden gorgeous and I can just imagine how good it would taste… I’m salivating here with my cup of matcha wishing I could dig in for a slice right now… it would be the perfect accompaniment to my afternoon tea! Well, the struggles I go through to make a pie (not to mention a cake) immediately sets me apart from the serious bakers. The kitchen looks like a post-tornado scene. On the other hand, I can make any type of bread and you barely notice any flour on the walls, ceiling, kitchen appliances, and pets. Interesting. What a great looking galette! It’s the first I’ve seen using a blueberry filling and I bet it tastes delicious but, then again, I’m partial to blueberries. It sounds like a fun club to join and you definitely belong. Thanks! It is a fun club indeed, I love it when they send the assignments and I get to indulge in a new blog, searching for a recipe to make. I know what you mean about the pressure, however, of all the “group events” I see in the net, this is the one I find the easiest to participate. Other groups make you cook one particular recipe, and it can be a very involved choice. This one you pick what you want, so if your life is too chaotic, you can always make something simple. Plus, the assignments are sent about 3 weeks before the reveal day, so you have some time to prepare for it. It looks like a great website as well! Sally, you’ve done it again! You’ve demystified a beautiful dish in simple language, with instructions that even I could follow. Thank you!! It looks gorgeous, and the “rustic” nature is the best part! Hope you try it, Vickie! it looks amazing! Love that crust and once again you have made me hungry! Galette looks delish! Great SRC pick! I think you can stop saying you can’t bake now, everything you have been baking has been amazing and beautiful and so delicious looking! Great job making this with all the craziness in your life!!! @Jenni, I totally agree, Sally the Bread Baker Extraordinaire should just drop the Bread in her title!! Oh my gosh! I don’t know how you pulled off that whole weekend. You are a wonder woman. 🙂 There’s no way I would have attempted baking in the midst of all that. I love your dedication and determination. And I LOVE this galette! 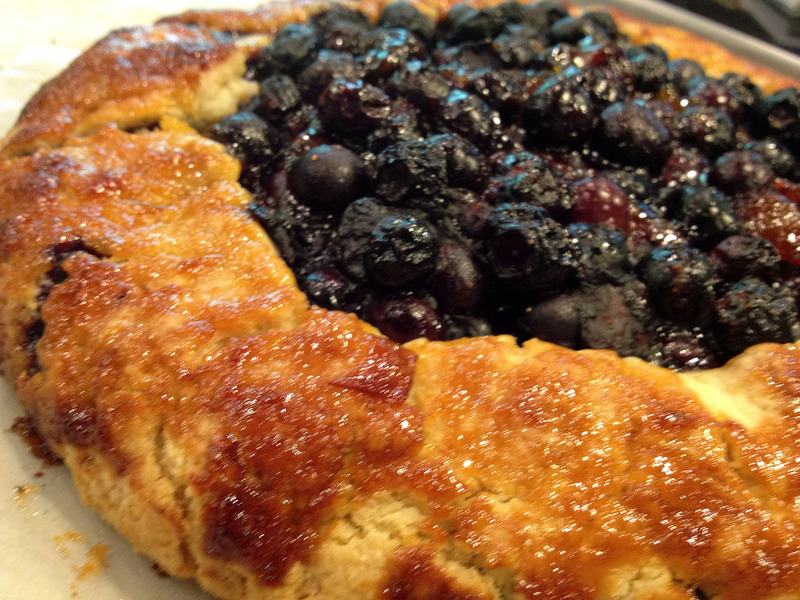 It doesn’t get better than blueberries and pie crust. And I think your pie crust looks divine. For not being a baker, this looks amazing! Your galette looks great! And, all those blueberries look delicious in the middle of it. You’re amazing to have fit this in during such a busy weekend! I just wanna grab a fork, no a spoon and take a scoop right off my screen. Your galette looks so YUMMY! I think your galette looks great! They are definitely supposed to look “rustic” if you ask me… haha of course, mine also usually look quite imperfect too. I also love the idea of eating the filling over some Greek yogurt, yum!